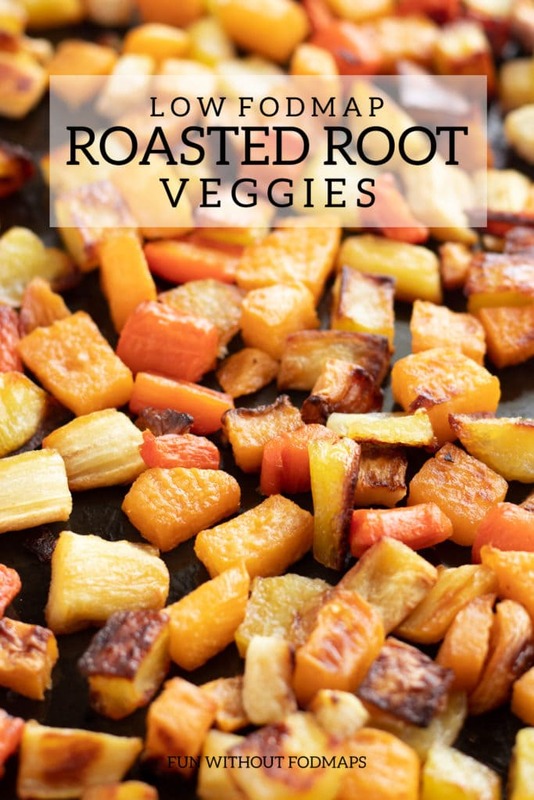 My favorite way to enjoy veggies is by roasting them! 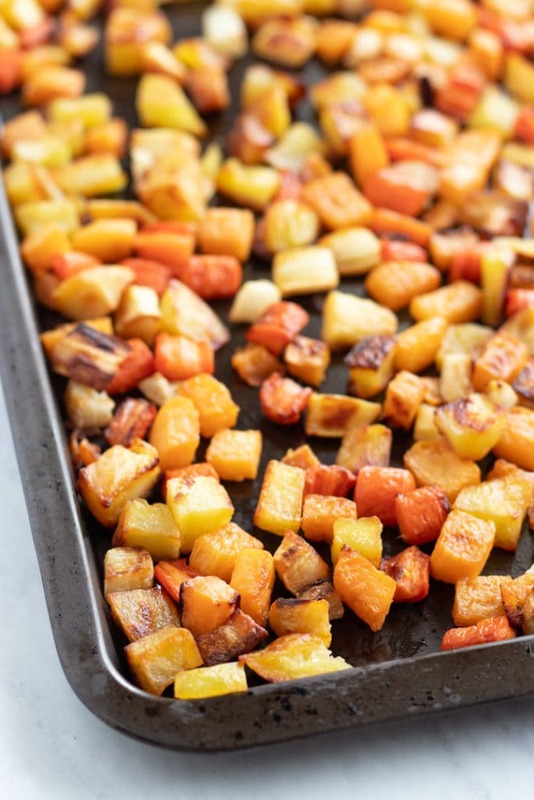 Roasting helps to bring out some of the natural sweetness and decreases the bitter flavor of many vegetables. Yes, roasting often means a little (or a lot) of slicing and dicing, but the end result is worth it! 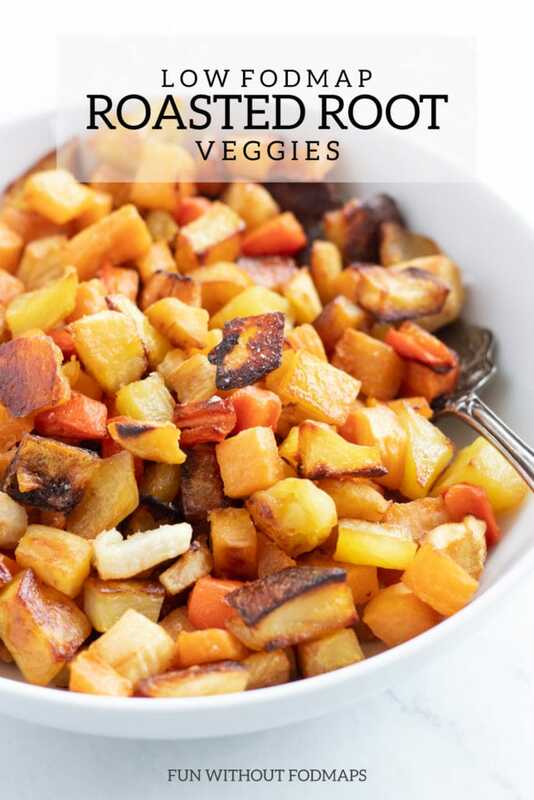 Roasted veggies get a bit caramelized on the outside and super tender on the inside. Yum. Yum! 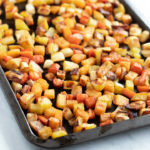 You can roast almost any veggie (except for lettuces and watery veggies like cucumbers), but this recipe features some delicious FODMAP-friendly root veggies! Carrots and potatoes are probably pretty familiar. Parsnips and rutabaga maybe less so. So, just in case, I’ve linked all of the veggies above to a really helpful resource that I used to use quite a bit during my supermarket dietitian days. The resource is called Fruits and Veggies – More Matters® and it’s an evidence-based website that outlines the nutrition facts, how to select, how to store, and suggestions for how to use a bunch of different fruits and vegetables. 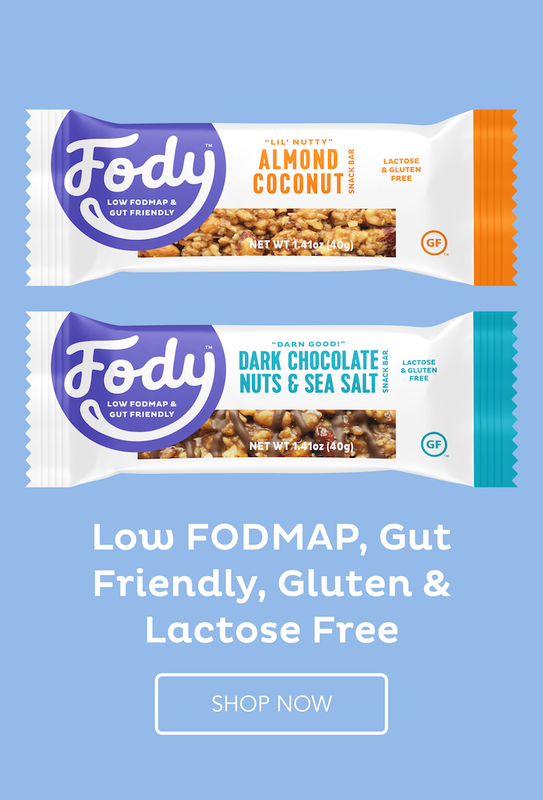 This low FODMAP side dish makes use of several FODMAP “freebies” or foods that did not contain any detectable amounts of FODMAPs when they were tested by Monash University. 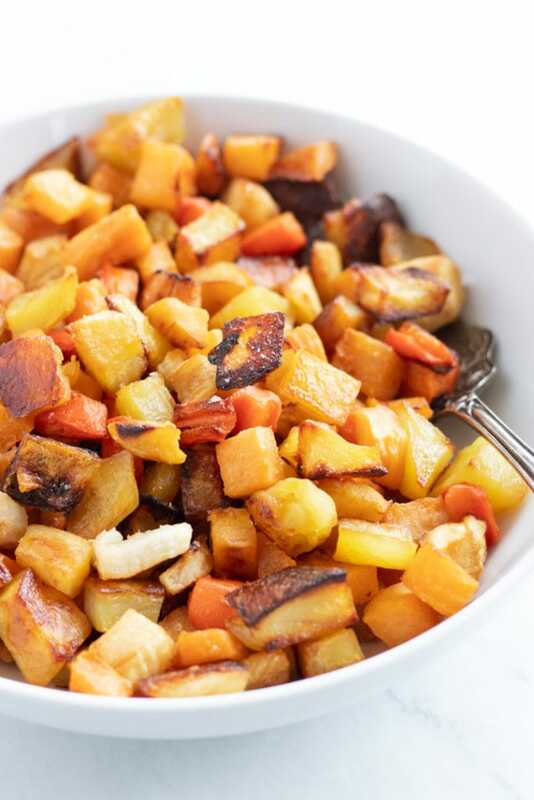 These include carrots, potatoes, and parsnips. The only one that is not considered a FODMAP freebie is the rutabaga. According to Monash University, rutabaga is low FODMAP in 1 cup or 75-gram servings. Larger servings (1 1/2 cups) do contain moderate amounts of FODMAPs. 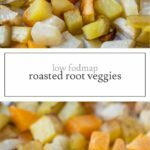 I like to enjoy these low FODMAP roasted root veggies with grilled or baked chicken or pork, a simple lettuce salad with a low FODMAP dressing, and a cup of red grapes. These veggies are also perfect for meal prep. They can easily last in the fridge for up to four days. So, I will also enjoy these veggies as leftovers for breakfast. I’ll reheat them in a frying pan with an egg or two. Sometimes, I like to add some kalamata olives in for a bit of healthy fat or a handful of chopped Swiss chard for a dose of green veggies. Then, I’ll serve everything with a low FODMAP serving of fruit and maybe a glass of low FODMAP milk. 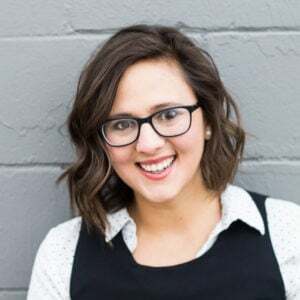 Note: This post was originally published on September 13, 2017, and last updated on February 4, 2019.